It’s Friday, the weekend is here to enjoy whatever it is we have going on in life. For us, it’s nice to be home. While I am grateful to travel for work and I love it, I am happy to be home four weekends in a row! That is nuts, it hasn’t happened since the beginning of the year. And since we moved, we haven’t had a chance to really finish s,all details in the house because of traveling. The weekends in between weekends of traveling, the last thing we want to do is house stuff, I need that for relaxing. So I am happy that it’s Friday and even happier that we have dedicated the next few weekends to finishing the rest of the garage, guest bedroom, and office. I can already park in the garage which is cool, someone could sleep in a clean queen bed, and we could get work done in the office. But there are still boxes to go through, donations to be made, and organizing to be done. And I am into all of it! I love organizing and decluttering. That is where you will find me this weekend, in a box, sorting and giving more stuff we don’t need to goodwill! I love it. On the other hand it will be nice when it’s all finished over the next few weeks. Because we will also be making time for date night tomorrow and family soup night tonight! What’s on your agenda this weekend? Creamy Lentil Soup is on our agenda? Totally. Warming for our cooler weather, so good, creamy, filling, soul satisfying, and super healthy. It’s a touch spicy with a deeper roasted chile flavor from the lightly dried red pepper flakes. I love that part. I do enjoy heat and spiciness in my food, but not so much that I can’t enjoy the flavors of the rest of the dish. I also know each of us have different tolerance for said heat, mine is pretty high. So when I make something with a kick, I back off a bit, just until my tongue can barely detect spiciness, that is perfect for what many people who don’t love heat, can tolerate. I love these pepper flakes from Gourmet Garden because they are mild in heat but bold in roasted chile flavor, that is the flavor I love. If you wanted more heat, add more once you serve yourself a nice warm bowl with a splash of fresh lemon juice, it makes all the difference. Enjoy! 1. Place olive oil in a large pot or dutch oven over medium low heat, once oil is shimmering, add onion. Cook over medium low heat until translucent in color, about 10 minutes stirring occasionally. Add chicken stock, raise heat to high, bring to a boil, reduce to a simmer over low heat. Add lentils and 1/4 teaspoon salt, cover and cook for 40 minutes. Add sweetpotato and cook until tender, about 15 minutes. 2. Add heavy cream, red pepper flakes, 1/4 teaspoon salt, and 1/4 teaspoon black pepper, stir to combine. Cook for 15 minutes uncovered over low heat. Taste for seasoning, add salt and pepper if needed. Turn heat off, add lemon juice and spinach, stir gently to combine. Serve immediately or allow to cool before storing leftovers in an airtight container for up to 5 days. Add a pinch of red pepper flakes for added spice. Freezer meal tip: Allow to cool completely before freezing. Place leftovers in a ziplock bag, or freezer tupperware for easy leftovers for up to 3 months. To warm up: remove from the freezer and allow to thaw in refrigerator or overnight to warm in a pot or microwave the next day. This Lentil Soup is a bowl of comfort and the addition of red chile flakes adds just the right spark. 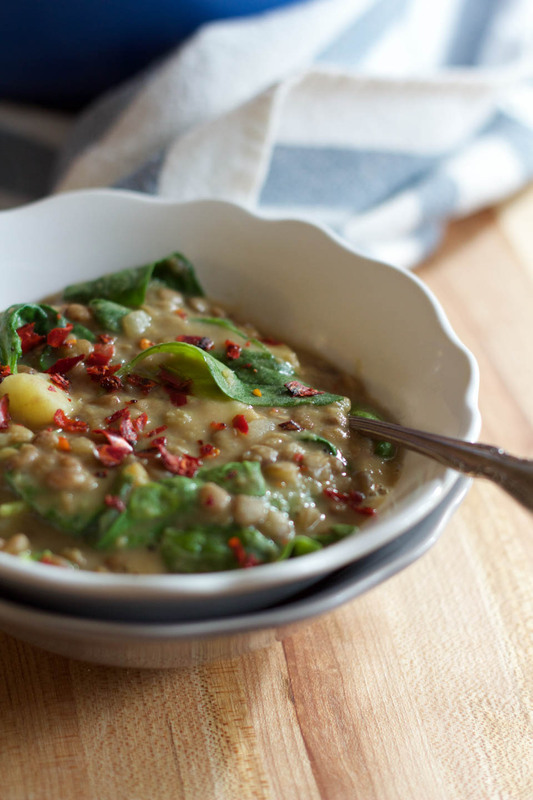 Lentil soups always benefit from bright flavors. I’m sure the chile flakes (along with the lemon) really add some spark! That good old brown food lol! Spinach and red flakes to the rescue. Creamy, comforting and perfect for that relaxing weekend at home. Seems like you earned this soup! Lentil soup is comfort food around here. 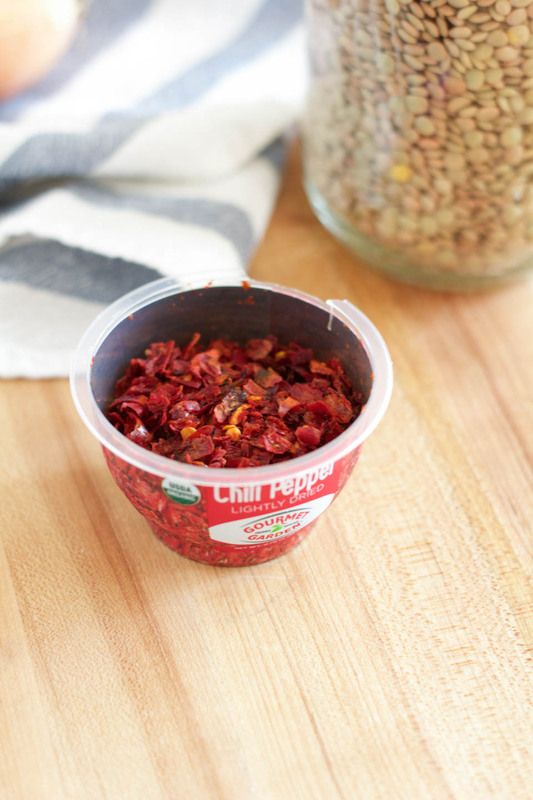 My husband loves a bit of heat with his so the pepper flakes would be a perfect addition. These pepper flakes are the best! I love lentils and lentil soup has always been a favorite. This looks great! Looks healthy, hearty and delicious! I love the addition of the cream in this. 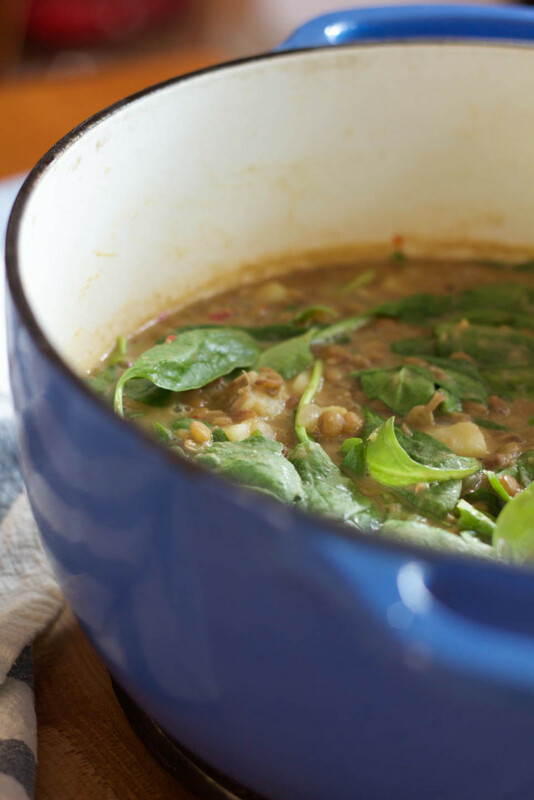 Lentil soup isn’t usually one of my faves but with the cream and kick of spice, this looks incredible! A touch of cream made it feel special lol! But always down with adding spice. This looks hearty, healthy and delicious! So glad that you’re able to enjoy some more time at home!! This soup looks absolutely delicious. I love that you used sweet potatoes in there.. AND LENTILS?? WIN! Thank you so much, Monique! It has been a glorious home time. Love lentils! 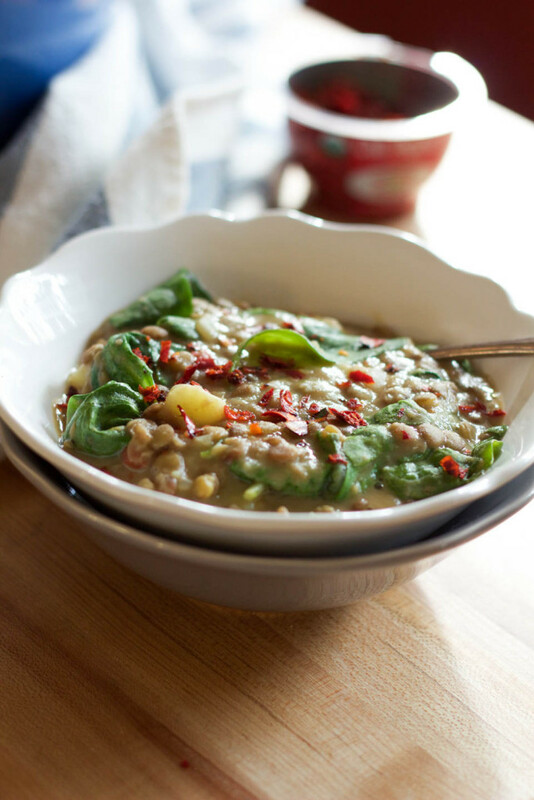 Thick, hearty, and healthy…so my kind of soup…especially with a little heat! Going to try YOUR lentil soup recipe! There’s not much better than homemade soup, this looks perfect for a cold night! Well, this looks so freaking delicious! Are you kidding me? I love being home for multiple weekends in a row. Seems like it never happens these days. Looking forward to trying this hearty and beautiful soup! MMM we always have our fridge stocked with Gourmet Garden Herbs! We just moved and I totally understand! I need a weekend at home just to unpack and get everything set up! It’s crazy! Ps. Love the soup! So comforting! I’m all about soup right now! I have a killer sore throat right now – I need this in my life!